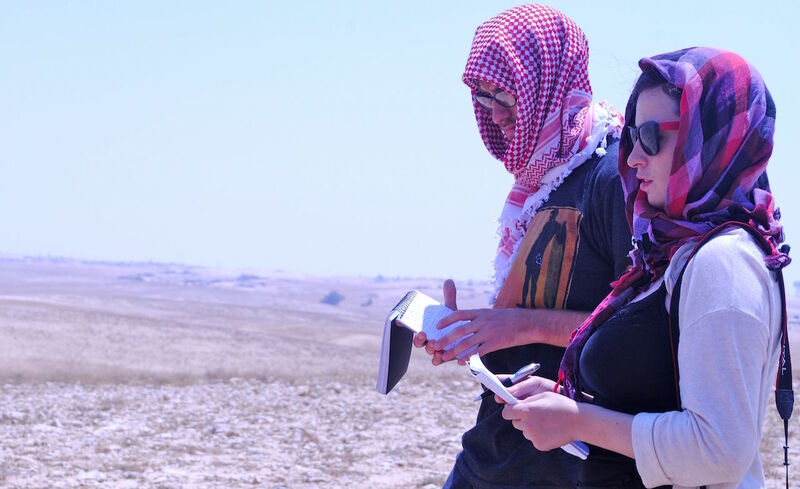 Will Lewis of Valdosta State University, left, and Maya Shwayder, a graduate of the Columbia Graduate School of Journalism, right, take notes during a presentation in the Negev desert during a 2013 study-abroad program to Israel and Palestine sponsored by the Institute for Education in International Media. Photo courtesy of ieiMedia. The job of foreign correspondent has long been the highest aspiration for many journalism students. But international reporting is evolving quickly with the technology and interactive tools now available to journalists, who have the ability to broadcast and report from anywhere in the palm of their hands. Programs such as ieiMedia teach international reporting skills to a new generation of journalists. We’ll investigate the options for journalism-study abroad programs and what’s involved in teaching digital skills to students training to be international correspondents in an hour-long #EdShift chat starting at 1 p.m. Eastern/noon Central/10 a.m. Pacific on Tuesday, Oct. 18. Guests will include Rachele Kanigel of San Francisco State University, Andrea Frantz of Buena Vista University, Vivian Martin of Central Connecticut State University, Amara Aguilar of the University of Southern California Annenberg School of Journalism and Communication, John Shrader of California State University, Long Beach, Meggie Morris of Northwestern University’s Medill School of Journalism’s Global Residency Program, Steven Listopad of Valley City State University, Kim Fox of the American University in Cairo and more. The chat will be moderated by Stacy Forster of the University of Wisconsin-Madison.